It’s a rainy, cool Saturday here. My dear husband has taken our older five children off to Northwest Trek, a nearby drive through type nature preserve. I put the toddler down early for his nap and I’m looking forward to several quiet and uninterrupted hours of sewing. Before I get started, though, I wanted to take a few minutes to update this poor, neglected blog. Things without pictures: I’ve been rearranging and reorganizing my sewing space. I’ve taken over more of the room, with a larger table and more lighting. I’m making upcycled curtains and as soon as I’ve got the last set done, I’ll have pictures. I’ve been giving sewing lessons to a couple young ladies. It’s been a lot of fun and I’m considering doing formal lessons for other homeschooled teens in the fall. 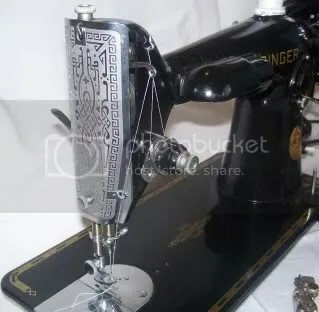 For example, Sewing 101 would cover how the machine works, how to choose fabrics, seam finishes and sewing techniques, how to follow a simple pattern, etc. The session would last about 6-8 weeks, 2 hours each week and we would make a couple of simple projects, like a grocery tote bag, a-line skirt and/or an apron. 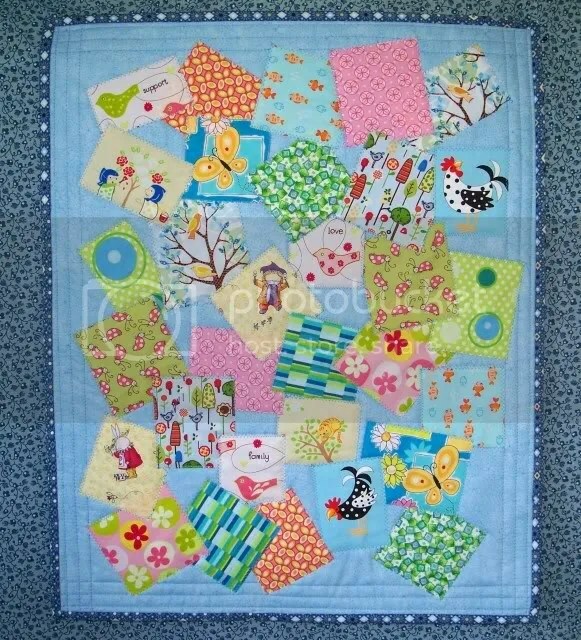 One thing I do have a picture of is the doll quilt I did for the Spring Doll Quilt Swap at sewingmamas. 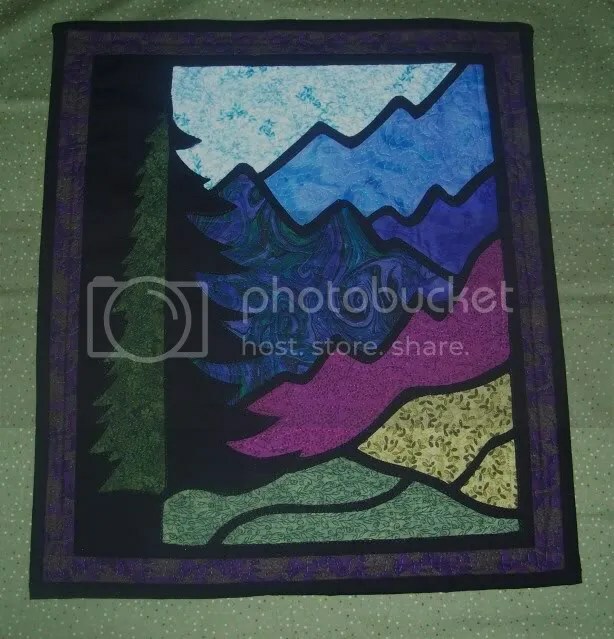 I saw this idea in a book of contemporary quilts. 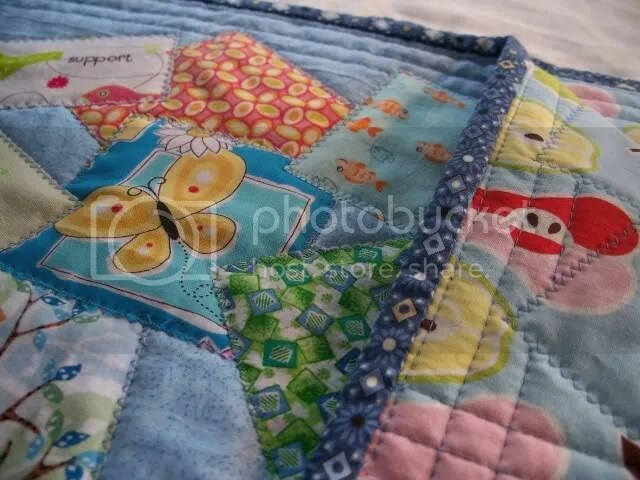 The squares are zig-zag appliqued onto the quilt after it’s sandwiched, so the zig-zags are visible on the back. A baby quilt for a sweet baby girl at our church. Three twirly dresses for a custom order. Summer skirts and capris for my girls and shorts for the boys. Well, time to get busy and make the most of this quiet day! 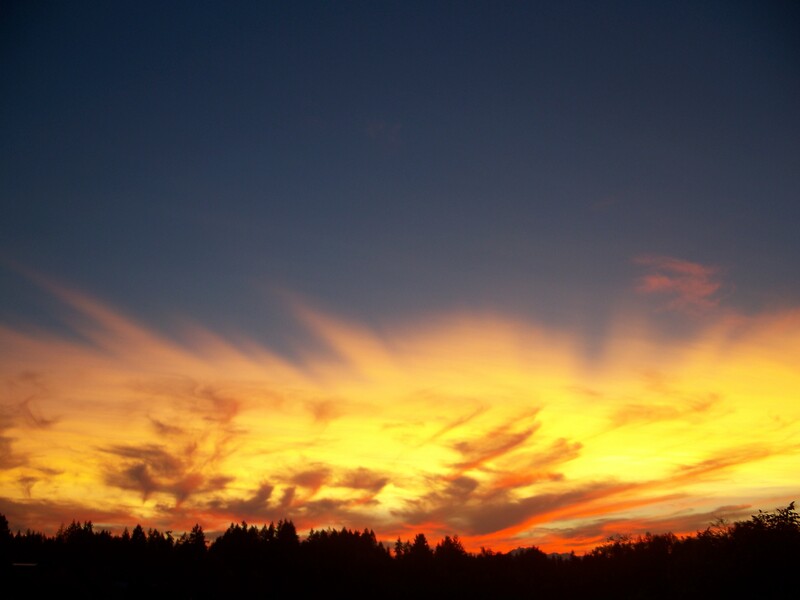 April is one of my favorite months…spring comes to the Pacific Northwest in April and it’s also my birthday month. I’m celebrating turning 40 this year by rearranging and redecorating my sewing room. I’m about half done, so no pictures yet…but soon! This is a lovely doll quilt I made for the winter doll quilt swap at sewingmamas.com. 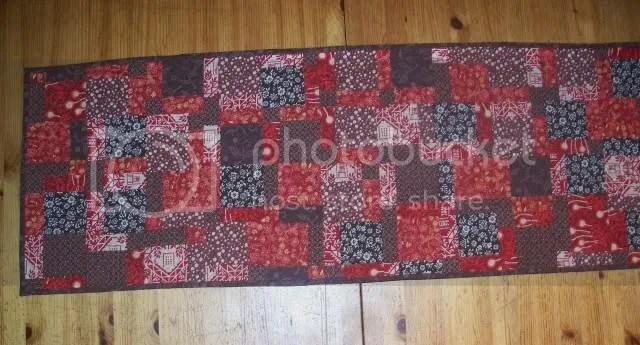 I had so much fun making it…it is a big departure from my typical block style quilting. 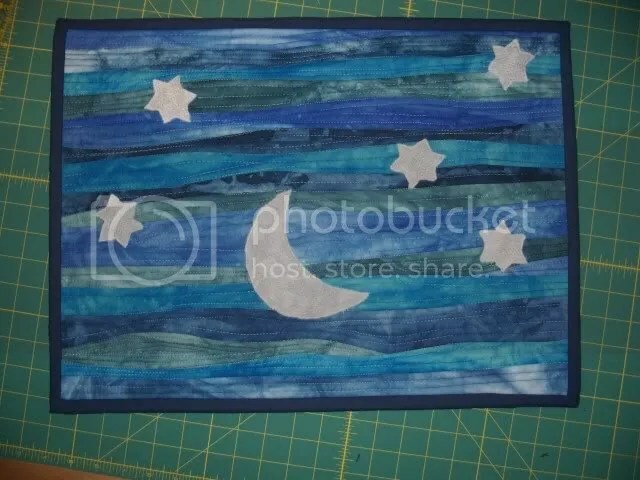 The moon and stars are raw edged applique and then hand quilted. 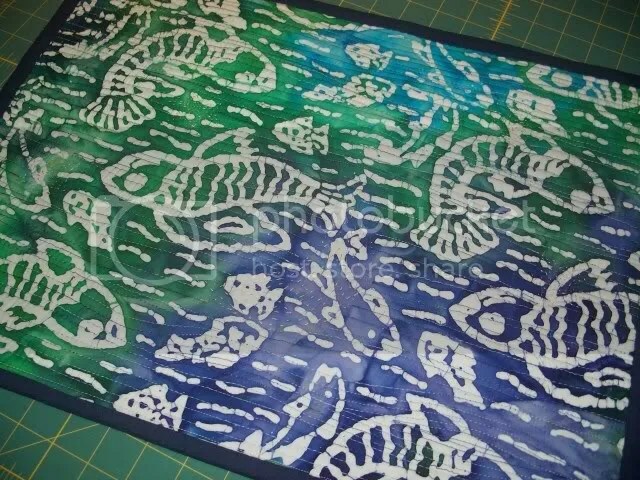 The sky background was machine quilted with variegated thread. And the back is a wild salmon batik print I found at the SewExpo in Puyallup this year. I’ve wanted to learn to knit for years. I’ve tried several times, and just couldn’t get the hang of it. Maybe I needed to try a different method, or not give up so quickly. Whatever. This past summer and fall, I made a promise to myself to learn to knit. I checked out books from the library and watched videos on YouTube. I practiced, ripped, practiced and ripped. And I’m finally feeling confident that my knitting will past muster. So, here are a couple recent projects. 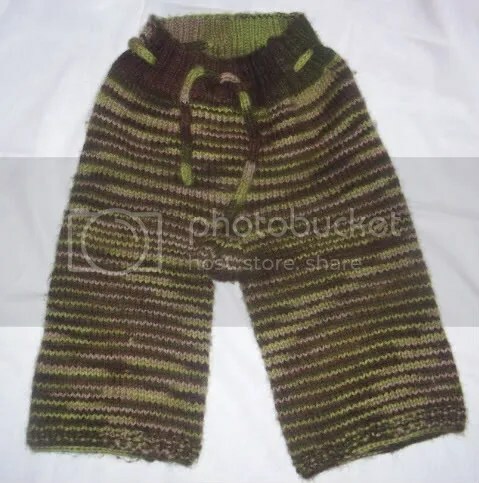 First up, wool soaker pants for my 14 month old. And yes, one leg is just slightly longer than the other, but not as much as the picture shows, they were just laying a little wonky. These are made of Paton’s Wool from JoAnn’s. I have some very nice wool from my local yarn shop that I’m using to make another pair, but I wanted to test my skills with something that didn’t cost $14 a skein. I used the Sheepy Time Pants pattern. Very nice pattern, lots of pics and helpful instructions, especially for a novice knitter. He has already worn these a couple of times and I’ve washed/rinsed them once, so they are starting to pill just a bit, but this yarn was easy to work with and I really like the color. I put a band of seed stitch around the cuff. The other major knitting project I finished recently is my first pair of socks! 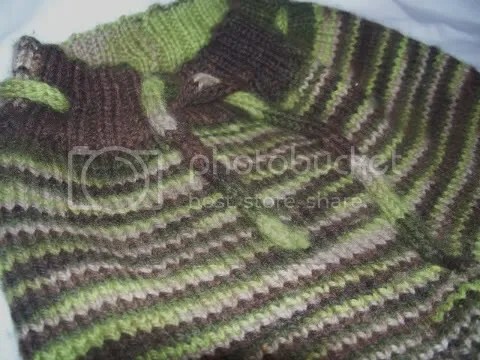 I used a toe up, magic loop pattern found on a blog called Streets and YOs. 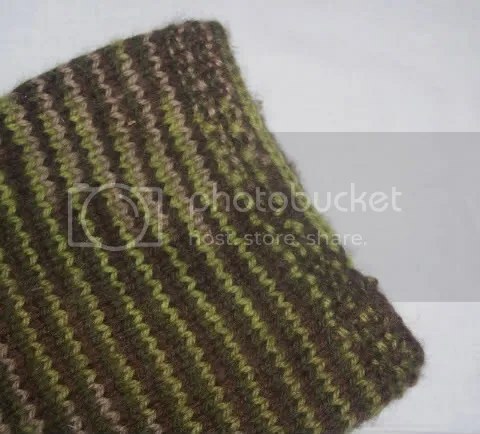 I used a self striping wool and nylon blend yarn from a local discount store. Again, I have a very nice dark green wool yarn from my LYS waiting for me, but I wanted to work out the kinks with the less expensive stuff. The first sock turned out a little big around the leg, so I did fewer calf increases on the second sock and it’s a tad bit snug, lol. 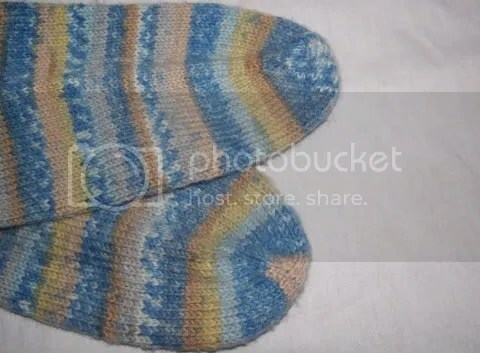 And both socks have too many holes at the heel. I did short row heels, and I can see that I need to really practice these and maybe get some help at my LYS next time. The toes were easy. 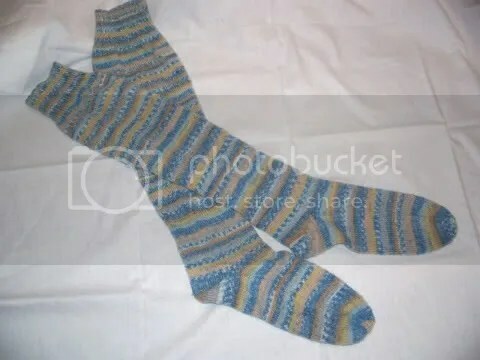 I chose toe up socks so I didn’t have to do any tricky moves to close the toes and also so I could try the socks on as I went. That was especially helpful as I wanted knee socks. I’m pretty tall, almost six feet, and wanted socks that actually went to my knees. I’m also a plus size woman, so making my own socks seems the best option at this point. As far as knitting goes, I’m working on another pair of wool pants, and dish/wash cloths made either with cotton yarn and/or crochet thread. I plan to do this scarf next and then this sweater. The sweater will be a huge challenge, as I have to upsize the pattern considerably. Hopefully I can find some help on Ravelry. Sewing wise…I have a tulle ballet skirt to make for a bday gift by Sunday. A couple of dresses. And a pillowcase for my mom’s “wedge” pillow that helps her sleep in an elevated position. And upcycling some skirts I found at the thrift store for me. And…And…And…the sewing to-do list is never ending! This is what my darling hubby bought me for Christmas. 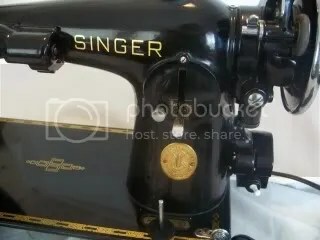 It is a 1938 Singer 201-2. Isn’t she lovely?? She came with several attachments. A ruffler, a zipper foot, a bias binder, a rolled hem and the long one on the left that I’m not sure what it does. It looks very interesting and useful, though. The paint and decals are pristine. It’s almost as if she sat in a closet for most of her life. And the scrollwork faceplate just makes me smile everytime I see it. The stitching is lovely. The 201-2 is a straight stitch only machine. Even on the “straight” stitch, a zig zag machine stitches will be just slightly off center. But a true SS machine like the 201 will make stitches that are precise and truly straight. This is not the best picture of the stitches my 201 makes. 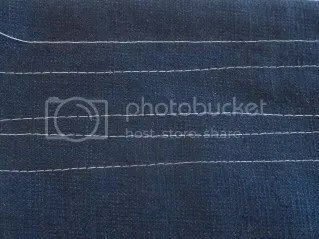 This is stitched on a lightweight denim and I think I need to change the needle. 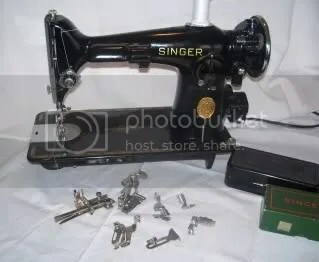 This brings my total number of vintage machines to 5: three singers (this 201, a 415 and my 501 Rocketeer), a Remington Singer clone from the 50’s and the Elna Supermatic. It’s just so hard to resist a lovely old machine that needs a caring home. One last pic of her shiny Singer badge. I used only fabrics from my stash! Yeah! The other challenge with this gift was to make it fast. I had a hard time deciding what to make for them and only came up with this idea at the last minute. So this runner went from an idea at breakfast to completely finished by bedtime the same day. The main colors are browns and reds, which are the same colors in their main rooms of their home. For the quilting, I free-motioned all over. I haven’t done much quilting, and it shows. But I’m improving!! On the back, I put a row of blocks down the middle. 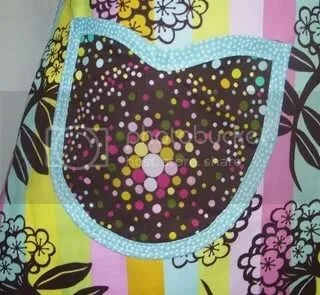 I wanted it to be reversible…bright and bold on the front and more subdued on the back. 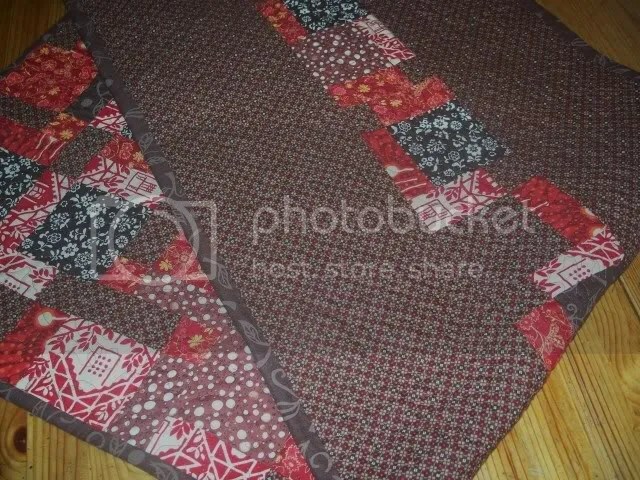 Next up on the sewing table is a quilt I bought at a thrift store. It was tied, but I really like the colors and the size is perfect for my 5 year old daughter’s bed. I’m machine quilting it and it’s about half done. Hopefully I can get it finished soon! But today, my mom is coming over to visit, so I have to get some dishes done and the hide-a-bed couch vacuumed. It’s been a while since we pulled the bed out and I’m quite sure there will be debris lurking down there! I thought I’d begin my return to blog posting! with this little doll quilt I just finished up for a swap at SewingMamas.com. It’s about 16X22, give or take a bit, just to give some reference. And the binding is not wonky, it’s just lying crooked on the table and then I didn’t hold the camera steady enough. My first ever stained glass quilt and I really like how it came out. And what have I been doing for the last year? Well, besides all the typical day to day stuff of a stay at home, homeschooling mom of six in a house without a dishwasher, I’ve been battling the monster of post-partum depression. I’ve finally gotten almost back to normal. Lots of hard work, prayer, walking, journaling, medication, talking and time. I’ve been sewing again since early fall, but haven’t had the energy to post about it. But hopefully I can get back to regularly sharing my sewing creations here. Thanks to the handful of friends who have encouraged me to sew and blog again. Love Ya!! We welcomed our newest baby boy just before 1 AM on Sunday, November 2, here at home as planned. He was about 10 days early, and weighed 8 pounds, 2 ounces and measured 20 inches long. Labor was a little longer and trickier in spots than we expected, but the real excitement came at delivery. Thinking it would be a “little while longer” the midwife went downstairs to use the restroom and while she was gone, my husband caught a baby! with our doula and a grandma looking on. I have lots of sewing projects to share and will try to get caught up here in the next few weeks! Another A is for Apron review. I think this is the fourth? Anyway, I do love the aprons in this book, so it probably won’t be the last! 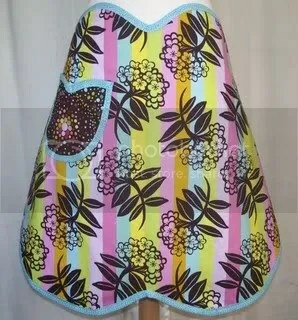 The designer for this apron is Joan Hand Stroh. In the book, she is quoted to say “I prefer classic, tailored clothing, so I seldom make frilly aprons. Never underestimate the impact of a simple design.” Oh, so true for me, too. As usual, I made some changes to the apron. First off, I made mine reversible. I prefer two layer aprons, probably because I’m a messy cook, and I always have trouble with bias binding a single layer of fabric. 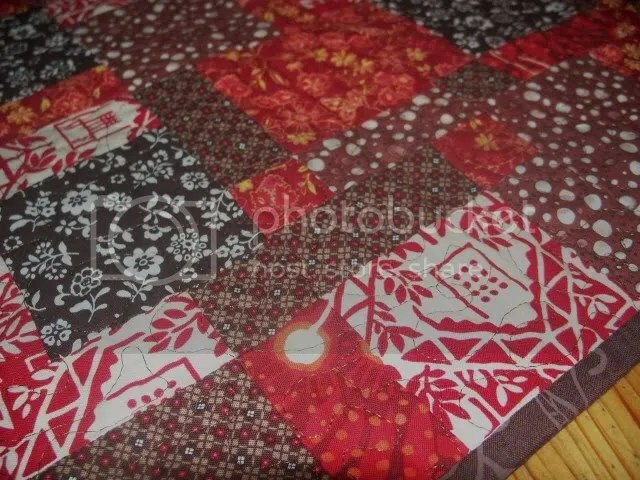 I also used wider bias tape, because I had just gotten this lovely Michael Miller pindot trim and thought it looked great with my Chocolate Lollipop fabric. It’s cotton tape (not polyester like the Wright’s brand) and the difference is clear. It goes around curves and corners much smoother. Then I lengthened the ties. 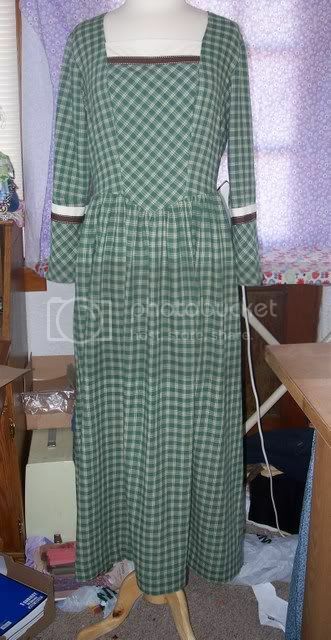 I could tell by the picture in the book that the ties weren’t very long, so I added several inches, so that the apron could be worn by a larger woman (like me!). Also, the pattern calls for the fabric to be cut on the bias, but I didn’t, mostly because I didn’t have enough of either print to do that. If you were using a single layer of fabric, I’d recommend that you did cut it on the bias, I think it would fit better (because it would stretch slightly). As for the directions in the book…after the struggles I encountered making the first three aprons, I largely ignored them. But reading through them, I don’t see any obvious problems, just the usual A is for Apron and M is for Make it More Complicated Than it Should Be stuff. I have listed this at Retro Femme for tonight’s stocking. 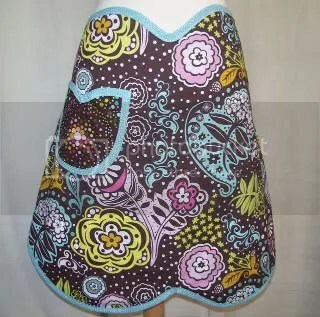 If you like the apron, but would like different fabrics (there’s a link over there —-> to my fabric album), please contact me. 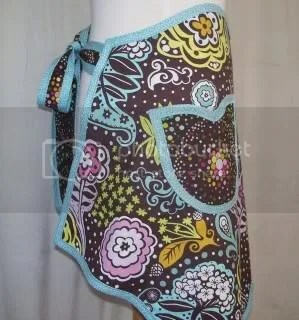 I’d love to make more of this apron! Wait! I can’t catch up!! There are times when my life (and probably yours, too) feels like an old-fashioned carousel ride. It keeps spinning and I’m trying to catch up and jump on, but I just can’t run fast enough to get on a horse, let alone grab the brass ring. Just when I think I’m getting close, the ride speeds up or I stumble and I get farther behind. I didn’t step foot in my sewing room for almost a week. We had several days of above average temps (around 90 degrees), which makes my west facing, used to be a sunporch, sewing room into a sauna…minus the steam and naked people. One day, just for fun, I put a thermometer in there…105 degrees. No way was this pregnant lady about to spend more than a few seconds there! Then, over the weekend, I was visited by a tummy bug. I will spare you the details, but I was totally useless all weekend. Thank the Lord above that I was the only one honored with this visitor. Yesterday, I surveyed the wreckage of my house. And decided that even though the balance of clean to dirty dishes was tipped way to the dirty side and that parts of the rug crunched when walked upon, the thing that really needed to be done first was to organize our home library and homeschool area. Hmm, could I be nesting already? I have reached the third trimester of my pregnancy, yeah!! Today, I had a grand plan to spend the first couple hours of my day (while the baby was still sleeping) sewing…or at least getting my messy sewing room ready to sew. Alas, the baby woke up early. Then, I spent the first half hour of my day unclogging the toilet. My sweet husband had already left for work, so the job fell to me. Finally, I was able to spend a few minutes on a huge job I’ve been wanting to get to for a while: taking & posting photos of all the fabrics I have available for custom orders. This is a huge undertaking, and I’m going to be doing it in little bites. I took 9 pictures before the camera batteries ran out (note to self: find the battery charger). 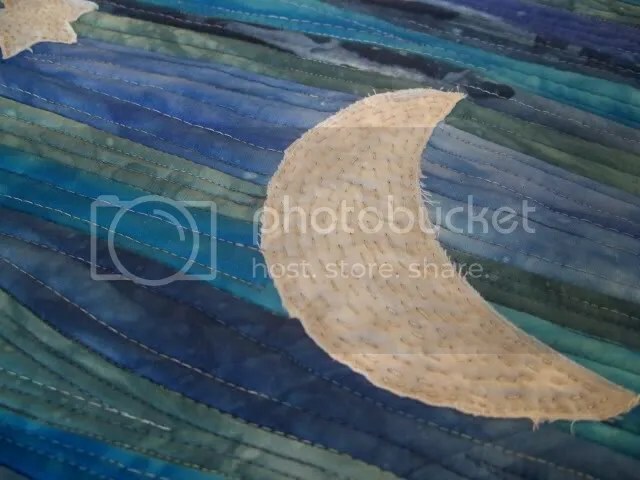 And I opened a new photobucket album for my fabric pics. I debated between pb and flickr, but picked pb because if I wanted to add another flickr album, I’d have to upgrade. Since I’ve spent a little too much on fabric recently, I decided to go the free route. Then I made a little button to put on my sidebar. So, I did finish rehemming a friend’s linen shirt. I put away all the (home)school supplies I’ve been gathering. I shelved about half of the book the toddler pulled off the shelves when I was busy elsewhere. I went to a long overdue eye appointment (yeah, it’s been over five years…). I picked veggies (cukes, beans & tomatoes) from our garden for dinner. And made dinner. I’m done for the day. Ugh. Tomorrow, I will spend time picking, shredding and freezing zuchini and figuring out the easiest way to make pickles without a pressure canner. I need to return some overdue books to the library and stop by the optometrist, because when I went today, I left my wallet at home and funny thing, they won’t order my new glasses until I pay for them. I will try to take another set of fabric photos and finish another A is for Apron apron for the Retro Femme stocking on Friday. I need to call a repair person for our fridge, which occasionally leaks water out the bottom. I need to do some laundry and start packing for our annual trip to the beach next week. Making sure that 6 other people have enough clean clothes for 5 days at the beach when the weather is doing a hot today, cold tomorrow thing will be fun. If I can do all that, I will start on a set of Bible covers for a local customer. I want to try out the new Amy Butler Birdie Sling bag pattern I just received. HA! What are my chances?? Can someone push the button to stop the carousel?? The dress is done! The WIP post is here. Final details: neckline was high enough, but too wide. I took in about 1/2″ on both sides of the bodice inset, but think it may need a bit more. The young lady promised to let me know if she wanted it taken in some more. I make the skirt a little narrower (but wider than it looks on my dress form) than the pattern because she wasn’t going to be wearing a petticoat or hoops underneath. The zipper and hem went in without any trouble at all. Here is the final finished dress (excuse the mess…I didn’t take the time to do an artsy fartsy pic, lol). I think I’m going to find some more of this fabric…I love the color and the drape and think it would make a nice, everyday skirt for me. Yeah…just what I need…another project on my to-do list!